Time for an old and under-utilized standby. Today we take a look at one of the Milwaukee Brewers most interesting prospects, Center Fielder D'Vontrey Richardson. A true project pick, with a different sort of measurement and all the tools in the world. A fifth round draft pick of the Milwaukee Brewers in 2009, Richardson was immediately considered the best athlete in the organization's farm system. Richardson was drafted after being a two-sport athlete at Florida State University. 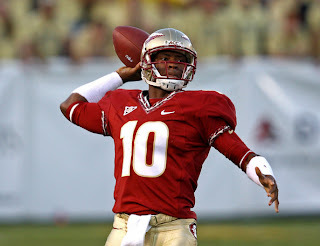 With the Seminoles he spent two seasons as a backup quarterback, where in 2008 he set a record for longest touchdown run by an FSU QB (a 55-yard run against Chattanooga). Now, Richardson is just a baseball player. He's in his second professional season in the Brewers farm system, playing last year with the Low-A Wisconsin Timber Rattlers and this year with the Brevard County Manatees, Milwaukee's High-A affiliate. With the Timber Rattlers last season Richardson struggled at the dish, to the tune of a .243 average, but also showed flashes of what he could be. In his 132 games with Wisconsin he had 28 doubles, eight triples and seven home runs. The tools and capabilities are there, but there is massive room for improvement. As a former running quarterback, the athleticism is tantalizing. Richardson is listed at 6'1" and 200 lbs, he has good size and strength for a center fielder. He showed flashes of his tools last year, with the 43 extra-base hits and also 17 stolen bases. He had a decent OBP in comparison to his average last season as well, sporting a .331 mark. Improvement is the word as well. In his first season Richardson hit .243, this season he is batting .289 including a .359 clip here in July. He has cut his strikeout rate as well, last year in 132 games he struck out 164 times, in the 67 games Richardson has played this year he has struck out only 40 times. Improvement. Until Richardson has had back to back good years it will be very difficult to judge what his future as a prospect is. Are his numbers and aberration? We don't know yet. If he comes back next year and strikes out 160 times again then everything we've seen this year tells us nothing. Those strikeout numbers in his first season are absurdly high, to the point you would call a player over-matched. Improvement is good, but it needs to be sustained. Also it is easy to call a player a five tool prospect but it's incredibly rare for there to be a five-tool major leaguer. While what he can do is exciting, it is also very unclear. The type of player he will be has yet to be defined and that is something that will need to happen in the next couple seasons of minor league ball. Yet to be determined is the answer to this question. D'Vontrey Richardson could be an All-Star and a starter just as easily as he could never make the major leagues. He could also end up anywhere in the middle of that spectrum as well. Next year might be the most important year in his minor league development, success at Double-A will go a long way towards seeing just what Richardson can do. In the meantime, it's good to see him get better from year on to year two. And hopefully will see sustained success in year three.